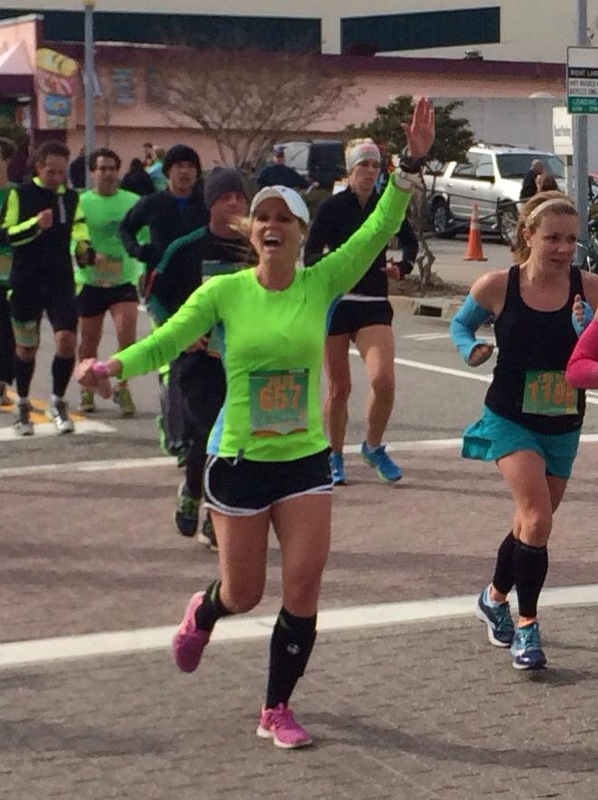 Virgina Beach Marathon – injured or not! 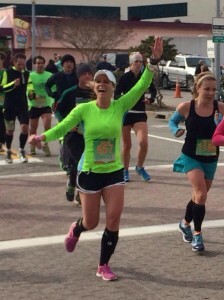 March 16 was the Virginia Beach Marathon – my hope for this years BQ. However, after a month “off” and still nursing a calf injury that ended up being worse than I thought (more on that later) I had to make a decision to pull out or not?!?! With the amount of time I pondered over this (and the professional opinions I sought out) you would of thought I was going for gold or something? And, I didn’t even have a shot at a BQ anymore – just trying to see if this body would make a finish?! I decided to go out to VA still not sure if a race was in my future. Long story short, I saw a new sports Chiro and a physical therapist the morning I flew out who both reluctantly released me to *try* it. 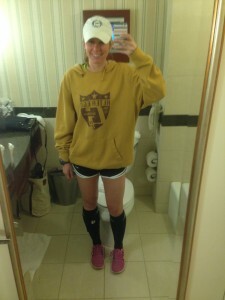 I had a slow release cortisone patch, k-tape and a brace on my calf in hopes to still run/walk 26.2 miles. 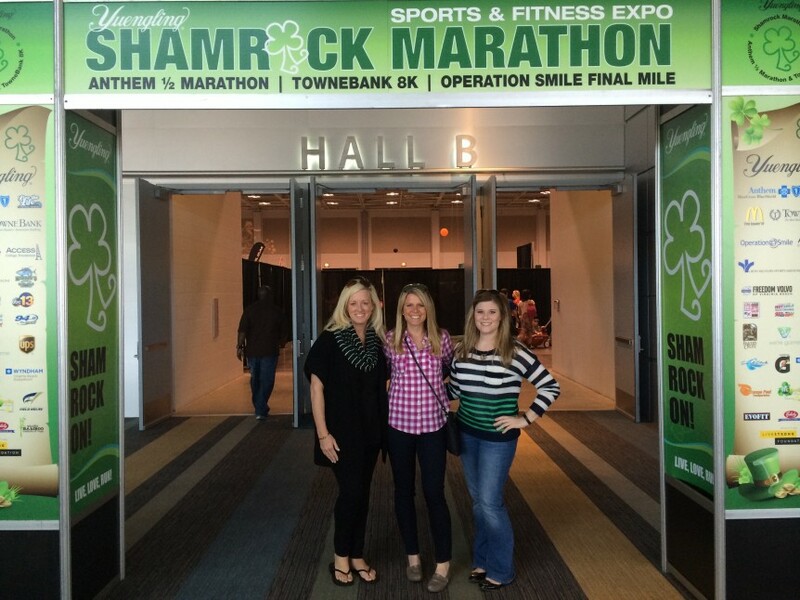 After an amazing time with my Besties wine touring, shopping and visiting Williamsburg – we headed to the convention center for the Expo. It was then and there my mind was set on running most of this race. I’ve got this. I am Julie Simon. We stayed at the most perfect hotel on the boardwalk (Thanks Tina!) The FINISH line was right behind us on the beach and the START line was just in front of us on the strip. I wasn’t nervous. I laughed all evening with my girls and even had a glass of wine! I really had no idea what race day would bring? I hadn’t run in almost a month but I was going to cover 26 miles dammit – injured or not. I started off at a moderate pace – 8:40 – but faster than anything I had done in weeks so I was ok with that. (Or, I tried to be) As the miles went on several runners passed me, a lot of runners passed me actually! It was a humbling experience. I paced in with this older man (50ish) who had ran Boston last year as well. We reminisced and shared our stories. That was one of the first times I really thought about what a true gift running is? I have been so lucky in so many ways. After April 15, 2013 I am still here. There is a purpose for me and more miles for me to cover. All of these thoughts and conversation took my mind off the pain for a bit. Boston-dude helped me run an 8:35 average for the first half. Almost immediately after crossing the 13.1 pad my body started to breakdown. Running on the pavement was just too much on my joints – my hips, IT band and knees started to ache terribly not to mention my calf. As I turned down the corner at mile 26 with point two to go, I saw the best friends in the world jumping up and down cheering for me. “JULIE SIMON” What a rush of adrenaline?! Coming down the shoot I knew this was my worst marathon time ever but I ran that point two on cloud nine! 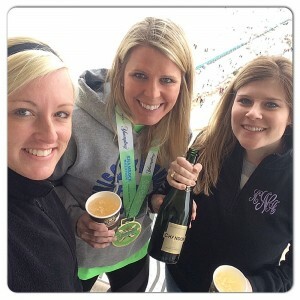 My girls made me feel like I was Shalene Flanagan! I finished in 4:12:34. My slowest yet. But we celebrated like it was a WIN. 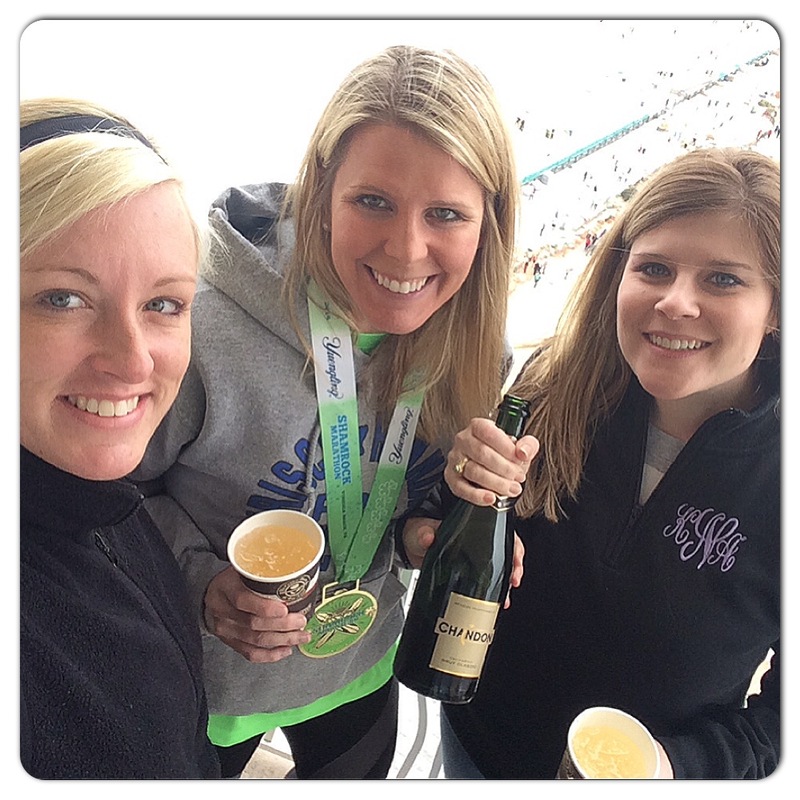 What a wonderful weekend… When can we do it again?!? (Minus the injury)!